I’m going to preface this review of Pro Evolution Soccer 2018 right now by laying out my perspective because I know just how serious fans can be about soccer. I don’t follow any specific team, I can’t name more than a dozen European players, and I don’t really care for the custom team modes in soccer video games. I’m a casual fan that loves the sport, played it for 15 years, and usually snags FIFA every other year. So if you’re looking for a careful critique of Messi’s rating, or the misplacement of a patch on an Arsenal jersey, look elsewhere. With that out of the way, let’s talk PES 2018. 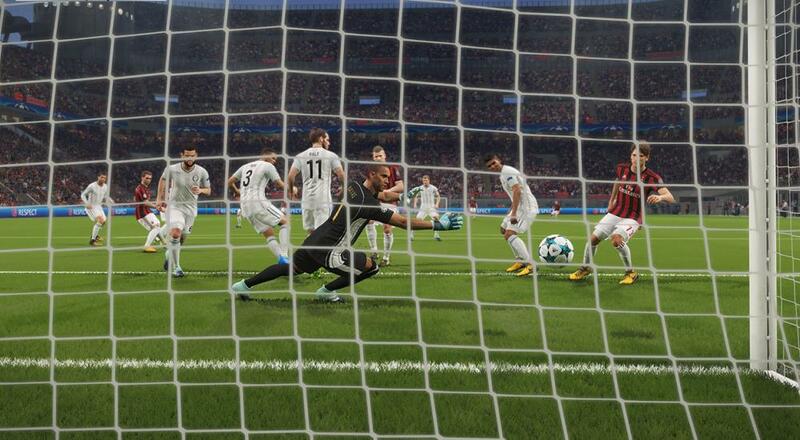 PES 2018 features some of the biggest changes to the series in a long time, specifically around the game’s graphics engine and licensing. 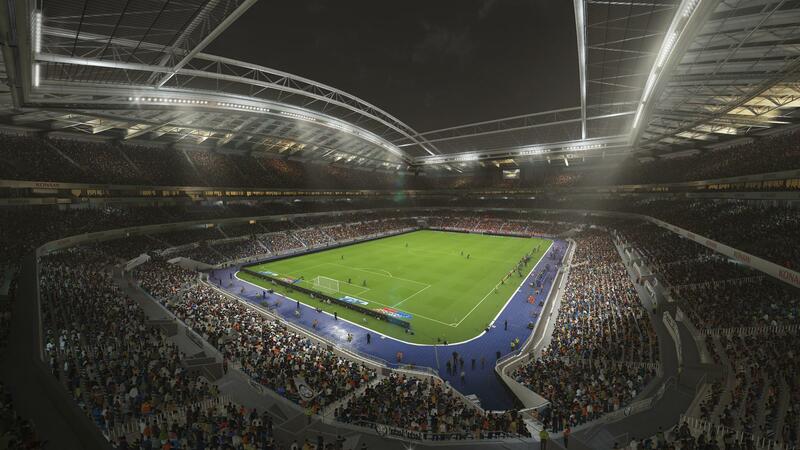 With 18 stadiums, over 30 teams, and hundreds of players - Konami is finally encroaching on the licensing area FIFA has had a foothold on for years. And while there’s a good representation of European, National and Liga MX entities here, but MLS is sadly missing. On the graphics side of the fence, the player animation system has gotten an update with more realistic physics for ball contact with various body parts. The UI was overhauled, which, makes me wonder how bad it was before...because frankly it’s still bad. From the get go you’re greeted with a standard affair of modes - quick play, online play, random match, co-op and MyClub. For folks that are all about acquiring random players to tweak their team chemistry and come up with their dream soccer club, MyClub fits that bill. Instead of relying solely on random packs of players like FIFA, you’ll be utilizing “Scouts” to hone in are a more targeted squad based on your needs. As per the norm in gaming in 2017, you can utilize in game credits you earn “just from playing” or play real dollars (after a conversion to virtual dollars) to get you there quicker. 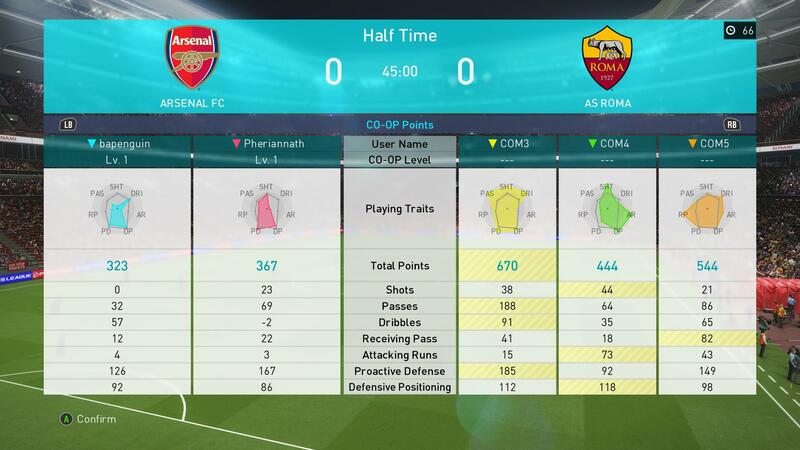 As a FIFA player, coming to PES wasn’t a huge learning curve - and there’s even an option for a more traditional FIFA-like button scheme. At its core I’d say there’s a few major differences in how the games feels between the series. 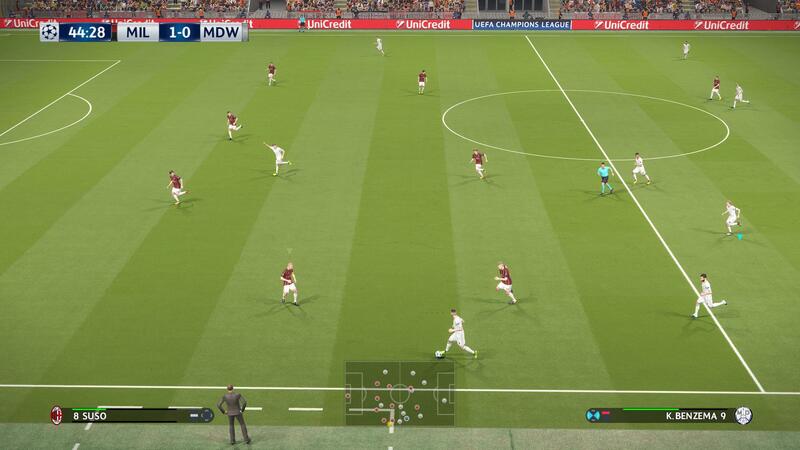 In PES, I feel like the off the ball play is more alive than in FIFA; you’ll see players make runs, call for the ball, and engage defenders to create space for you. The ball physics of PES also feel more authentic. I've seen the ball do things, like careen off random parts of players' bodies into unpredictable locations. The bottom line is the core gameplay for PES 2018 is solid, satisfying and fun. The AI doesn’t feel like they cheat (too often) and the matches rarely get out of hand with the scoring. The matches I played always felt competitive and didn’t drift too far in one team’s favor. The overhauled graphics engine is absolutely gorgeous, and playing the game in 4K on my PC is complete eye candy. New this year is the game’s co-op mode. To call it a mode is kind of a misnomer really. Once you create a co-op clan (Konami, a clan, really? Why not Club?) you’ll have access to a co-op lobby from just about any game mode. What this means is you’ll be able to play a game of PES with a co-op partner (or two) in MyTeam, UEFA League, Online Challenges, or many of the other game modes available. This opens up the realm of possibilities for things to accomplish with your friends. In terms of persistence, Pro Evolution Soccer 2018 allows co-op clans to earn experience, trophies, and rankings in an overall leaderboard type scenario. Individual and global stats are kept for all members of the clan. Any of the game modes can be played by more than one player in a clan and can be continued at any time allowing all players to complete leagues or participate in MyClub. In terms of offering a reward for all players, all PES 2018 players will earn GP towards their own MyClub game mode in any of the co-op matches. In addition the online co-op tournaments allow players to earn additional bonuses like players, scouts, or other currency. Actually playing co-op is a ton of fun too. As with most real life team sports, you’ll have to communicate with your teammates and work on your “off the ball” play. That says, initially there’s a difficulty spike to co-op, usually because players will switch between the same players quickly or switch to a different player than expected because a teammate jumped in first. I don’t think there’s much to be disgruntled about in PES. It’s just a solid experience all around. I would say it doesn’t excel at any one thing, but there aren’t very many weak points either. The co-op gameplay additions are a really unique way to integrate that experience to enjoy with your friends and not silo it to just a single mode. I’d say as long as you aren’t die hard about having every single player, team, or stadium - and just want to enjoy a soccer game with friends - this year’s Pro Evolution Soccer is a good year to give it a go. Page created in 0.9975 seconds.